I whip around the corner paying no heed to the bumpy road or to the fact that 140kmph is maybe a little too quick for the road. And then I realise that the road dips sharply down into a bridge, swings a sharp right immediately afterwards and there's a long straight stretch coming. I brake as hard as I can up to the crest, and then feel the imposing mass of the GT650R get completely airborne. A moment of silence and then the bike crashes down on the road with an almighty thud. Even as the chassis settles, I have no choice but to bring every ounce of strength to the handlebar, pushing hard to make the Hyosung turn sharply right. I certainly don't want to be calling the chaps at Garware Motors to say I couldn't make the corner, right? The motorcycle responds slowly and once I am confident of the line and the grip from the Bridgestone Battlax tyres, I nail the throttle again, allowing the Hyosung to surge forth once more back up to high speed. The new Hyosung GT650R can be ridden like this, but it requires enormous amounts of effort, very high concentration and many, many times, it's sheer rider will power rather than chassis ability that carries your through. But let's start at the beginning. The Hyosung GT650R's tubular twin-spar chassis is now pretty old. It was the same platform that spawned the GT250R, the bike we know as the Comet. The Comet felt large for a 250 and the GT650R, unfortunately, also feels a little bit too large for what is substantially a budget 650 in most markets abroad. The V-twin motor was originally carburetted and this one now features fuel injection. The four-valves-per-cylinder DOHC V-twin is based on the same architecture as Suzuki's effortless and well liked SV650 V-twin. The 90-degree V-twin features water-cooling and is mated to a 6-speed transmission. All told, the package makes an impressive sounding 73.7PS at 9000rpm and 60.9Nm is the peak torque, arriving at a relatively high 7500rpm. But it is a V-twin, which usually means strong torque, and in the 90-degree configuration, good primary balance and consequently less vibration related issues. In the real world, however, this does not compute. In feel, the sound of the engine is loud at idle and it has the thrum we associate with twins alright. But when the revs come up as you ride, the sound turns thrashy more than evocative. Then you also notice that the engine feels rough to use and past 6,000rpm, our test bike coughed up a lot of vibration which got steadily more pronounced right to the redline. This makes riding the GT650R at elevated pace and high revs very hard on the hands and legs which go numb from the vibes pretty rapidly. That having been said, when I finally did back off, I discovered that sub-6000rpm performance is pretty sweet, vibes are a non-issue and that in sixth, 6000rpm equals around 140kmph, more than enough for 99 per cent of the Indian riding cycle. To be fair, this is an older engine and some of the coarseness is just pure age. It isn't slow though, taking 5.18 seconds to get to 100kmph on its way to its 202kmph top speed. Along the way the bike gets up to about 185kmph on the speedo with little fuss but the rest takes space and time to arrive on the digital clocks. The transmission similarly works neatly but hard riding can produce missed shifts and it feels positive but not entirely slick. Like all multi-cylinder engines, the motorcycle produces substantial amounts of heat, which you will feel when riding slowly. But the water-cooling obviously works with the temperature indication on the digital gauge hardly ever crossing the mid-point. Like the nature of the engine performance, the chassis too feels a bit last-generation and lacks the fluidity of the current motorcycle chassis. At 215kg, this is a heavy motorcycle and you always know you're on a big-boned, heavy-massed machine. At speed, changing direction requires physical effort and tipping this motorcycle into a corner is neither feather-touch nor hair-trigger. Get it leaned over and it feels good if heavy. There is stability to be enjoyed and the tyres grip well enough on tarmac to produce fast corner exits. Ride quality on the other hand, is ponderous with the motorcycle feeling like its wheels are way too heavy. Ever worn a pair of DMS boots right after walking around in slippers? That's what the Hyosung feels like. It thuds through bumps, ripples produce discomfort and mid corner bumps don't unsettle the chassis as much as they do the rider. The landing of the jump suggests that the inverted telescopic fork - adjustable for compression and rebound (but not preload) and the rear monoshock, adjustable for preload do have the internal wherewithal and require careful tuning to make the chassis feel better overall. The brakes are a weak spot, I have to say. These are Korean made, and feel soft and spongy to use unlike the sharp and effortless units we've come to be used to now. Hard braking involves a serious amount of fork travel and four fingers clamping down strongly on the lever. Where the motorcycle will shine is in the styling department. Again, the exhaust placement suggests an old school sportsbike but in motorcycle-starved India, this bike garners attention easily. The GSX-R inspired bodywork and the vertical headlamps are not my personal picks for a great design, but it was clear that people thought highly of the motorcycle's looks. Will the same aura remain if, say, an R6 were parked next to it, though? Perhaps not. Here again, we felt that the finish levels as well as the build quality could be better. The switchgear, for instance didn't feel top drawer and the vibration from hard riding managed to dislodge one of three retaining bolts on the end can as well as the right side rear indicator bolt in the course of the test. As you can tell, the Hyosung GT650R isn't the effortlessly great motorcycle we were hoping it would be. It subscribes to an older school of sportsbikes and comes across as a motorcycle that could do with some overall refinement, on the engine feel front, on the chassis dynamics front as well as on the fit-finish and build quality front. Now, we have all read the relatively good reviews of the motorcycles in American and British media, so what happened to the Indian road test, you might ask. Well, the Hyosung wasn't set up for India. On better roads, in calmer riding conditions, I believe the GT650R will come across as an adequately capable motorcycle. But Indian roads are torture and the suspension basically finds it very hard to cope with the bad surfaces and badly constructed roads. It makes your task of riding at a good clip that much harder. What does not help is the committed ergonomics. The reach to the bars is pretty long and the bars themselves are pretty low, which put you into a racer crouch and leave you no alternative despite the wide and comfortable seat. This is not going to be an easy motorcycle to ride daily, though a well-known, well-surfaced mountain road and a skilled rider could still be a thing of wonder. 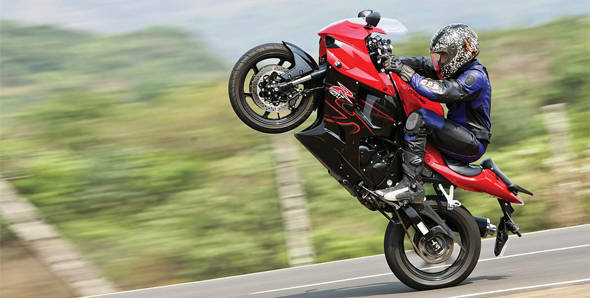 Substantially, what this Hyosung needs is fine-tuning and honing. The engine and chassis both appear to have ability but are not performing to their fullest. But the test reads more grim than the actual situation because Garware Motors is playing it smart. Its first dealers will be in Tier II towns and not in the big metros, starting with four dealers at launch and more coming. These are places where the GT650R will sell easily because it is without doubt a substantial motorcycle for the money and because competition will be slow to reach these places. Dealers are already taking Rs 50,000 bookings on this Rs 4.6 lakh (approximate ex-showroom price) motorcycle. Hyosung is to announce final prices and plans shortly. Garware plans to offer just one free service and a 2-year, 25,000km warranty on the motorcycle but will have spares in stock, at reasonable prices as well as a service van for customers too far from dealers to go to the authorised service centres. Hyosung's second innings in India, thus, has begun. The GT650R is a motorcycle that holds a lot of promise in terms of the company's ability to develop motorcycles, but it also shows that the company has a lot to learn before it can take the fight to the established Japanese competition. The Korean automotive industry has shown that it can learn, adapt, evolve and outperform the Japanese and it's up to S&T Motors, the owners of Hyosung to lead the brand down that aggressive growth path. In the mean time, I expect that the GT650R will fly down the straight in smaller Indian towns until Bajaj can (finally) settle the matter of the Kawasaki Ninja 650R with a launch and its usual aggressive pricing. When that happens, though, there will be fireworks. The Hyosung GT650R promises a lot on paper. However, unless you're riding gently, this is a motorcycle that requires a lot of effort to ride enthusiastically and to corner hard. Part of the issue is its weight and size, both of which are on the higher side for a middle displacement 650cc motorcycle. The other half of the issue is engine refinement which suffers from vibration as the revs cross 6,000rpm. The brakes too could be vastly better. That said, for the price, the Hyosung slots neatly into a part of the market which we have long believed makes a lot sense for the growing bigger displacement motorcycles. Garware Motors will have to demonstrate that the service back-up and experience and spares availability and price meet customer expectations if the Hyosung is to do well once similarly-speced competition arrives.